Previously unknown tetradentate ONNO-type ligands 1–5 (4,7-di(4-R´-phenoxy)-2,9- di(HOCR2CH)-1,10-phenanthrolines (R´ = Me, R–R = –(CH2)5– (1), R = Me (2), R–R = 2,2-adamantylene (3); R´ = But, R–R = –(CH2)5– (4), R = Me (5)) were synthesized by sequential treatment of 2,9-dimethyl-4,7-di(4-R´-phenoxy)-1,10-phenanthrolines 6 (R´ = Me) and 7 (R´ = But) with excess LDA and appropriate dialkyl ketone. The structure of compound 4 was determined by single-crystal X-ray diffraction. Previously uncharacterized phenanthroline 6 was synthesized by the treatment of 4,7-dichloro-2,9-dimethyl-1,10-phenanthroline with excess p-cresol in the presence of KOH. The reaction of compounds 1–5 with one equivalent of Lappert´s germylene or stannylene, M[N(SiMe3)2]2 (M = Ge, Sn), gave the corresponding germylenes 8–12 (M = Ge, R´ = Me, R–R = –(CH2)5– (8), R = Me (9), R–R = 2,2-adamantylene (10), R´ = But, R2 = –(CH2)5– (11), R = Me (12)) and stannylenes 13–17 (M = Sn, R´ = Me, R–R = –(CH2)5– (13), R = Me (14), R–R = 2,2-adamantylene (15), R´ = But, R–R = –(CH2)5– (16), R2 = Me (17)) in satisfactory yields. According to 1H, 13C, and 119Sn NMR data, the synthesized stannylenes are monomeric in solution, and the tin atom has a coordination number of 4. 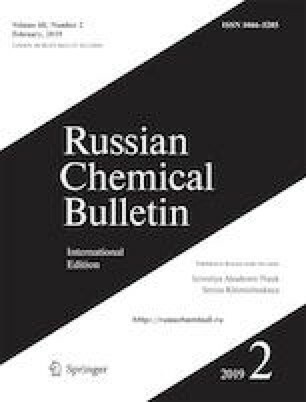 In the series of the compounds under consideration, stannylene 16 proved to be the most active initiator for e-caprolactone polymerization, whereas the germylenes were shown to be inactive in this process. Published in Russian in Izvestiya Akademii Nauk. Seriya Khimicheskaya, No. 2, pp. 0380–0388, February, 2019.